TOTAL FLANKER...a rugby blog: Same game? Following their Go Play Rugby campaign last year the RFU are now promoting the Play On campaign which encourages people to continue playing rugby when they, for whatever reason, have to re-locate to a new area. All very laudable you might think, and the campaign's tag line - New town. New team. New mates. 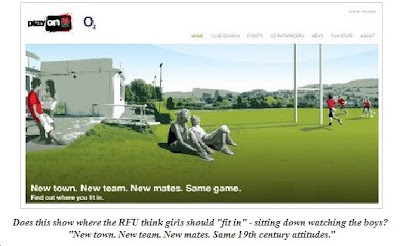 Same game - Find out where you fit in - has a certain ring to it, but John Birch of the Letchworth Girls Blog makes the very valid point that the imagery used to support the campaign is hardly inclusive. "Have a look at the main graphic," he says. "Who is playing, and who is watching? "And its a shame really because underneath this fantastically inept cover is an initiative that is actually quite a good idea." Personally I doubt this was intentional on the part of the RFU, but it does highlight how much attitudes still need to change.